LG Mobiles today further strengthened its CDMA portfolio by announcing the launch of six open market CDMA phones in India. The newly launched CDMA handsets offer complete freedom of service portability that allow users to choose any CDMA provider just like in the case of GSM phones. 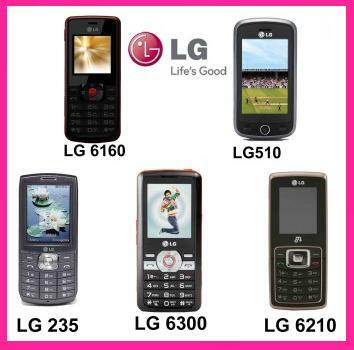 The phones introduced by the brand include LG 6160, LG 6210, LG 6300, LG 6400, LG 510 and LG 235. LG betting big and highlight the brand’s technology prowess in the CDMA open market (OMH) with great technology experience with six different handsets in the category. LG6160 : A compact & sleek phone which has MP3 player with 3.5mm jack, FM Radio with recording, Torch, Upto 4GB expandable memory, Bluetooth, Hindi language support & a long battery life. All these features make this phone a complete All Rounder phone and is priced at Rs2649. LG6210 : A complete multimedia phone loaded with features offering great entertainment apart from being a connectivity device. It packs in FM radio with recording, VGA camera with video recording, MP3 player with preset equalizers, Bluetooth, upto 4GB expandable memory. Some of the other interesting features of the phone include FM sleep Timer which helps user to set FM to be auto-switched off after 15, 30 or 60 mins (based on the time set, FM will automatically be switched off), FM & MP3 playlist which can be played in the background while the user is experiencing some other feature in the phone, helpful tools such as City Distance Calculator, BMI (Body Mass Index) calculator, EMI calculator & Panchang. This phone has been launched in the Buzz category of LG Mobile phones & is priced at Rs 2999. LG6300 : A music phone – touching a high note is LG6300’s superior music features like 2.1 channel active sub-woofer and side-stereo speakers’ incredible sound. And if 2MP camera, MP3 player, Wireless FM with recording & editing and Bluetooth get added to it, there’s no stopping. Break free & enjoy all freedom with LG6300 which is priced at Rs 4749. LG6400 : It’s a stylishly designed multimedia phone with 1.3MP camera and video recording, Wireless FM with FM recording, MP3 player with 3.5mm jack, Big Screen (5.08cm), Upto 4GB expandable memory, Bluetooth & Built-in modem. Apart from this, the phone offers Hinglish support & a great battery life. The phone is priced at Rs 4425. Cookie Zip (LG510) : There is more exciting than watching your favorite programmes on the go. Get the new LG Cookie Zip CDMA phone and experience the thrill of watching videos online and 24×7 with its advanced Internet access technology. See all the action come alive on its 7.6 cm wide WVGA full touch screen. Also enjoy the experience of full internet browsing and One Touch Social Networking on the go. It’s all happening here. Catch it Live! Cookie Zip is priced at Rs 8000. Cookie Spark (LG235) : Choose the fastest way to connect with your gang with the new LG Cookie Glide, with 5 MP camera and One Touch SNS update. Use their Wi-Fi capability to connect anytime, anywhere and take charge of your social circle in a jiffy. Go ahead, make your move instantly with Cookie Spark which is priced at Rs 5898.
you told about bb cdma world edition. Ok. But what if i went to a country where only gsm signals are available? Blackberry 8830 World Edition is CDMA+GSM handset. you can use the GSM part there. Thanks for information, but jab video call ka jhanjhat hai nahin to price 5000/- ke aaspaas hona chahiye. 7500/- se 8000/- mein to aur jyada features wale GSM phone aa jate hain.